We have included a review of ‘Mozambique and Tanzania – asking the Big Questions’ with some misgivings, because its critical conclusions do not seem to be based on adequate research. Lack of time to talk to ordinary folk and ignorance of local languages must be regarded as a handicap in drawing firm conclusions about local consultation and initiative. However, the book is now available and its pretentious title might lure readers into thinking that it had something important to say. To offset my possible prejudice, I found a sympathetic reviewer. 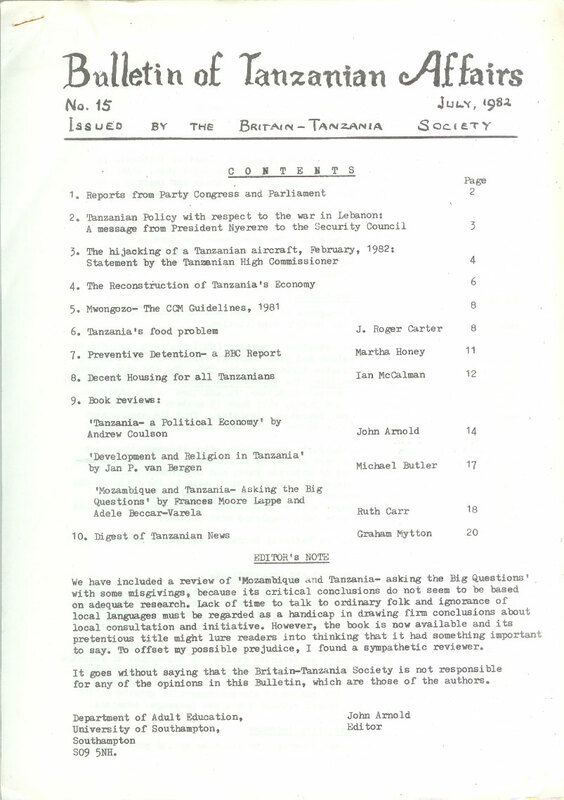 It goes without saying that the Britain-Tanzania Society is not responsible for any of the opinions in this Bulletin, which are those of the authors. Department of Adult Education, University of Southampton, Southampton, S09 5NH. 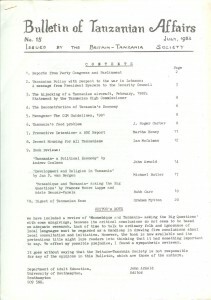 We began the last issue of the Bulletin with a report of forecasts of severe food shortage in Tanzania early in 1982. It appears that, although there have been local shortages, surpluses in other areas and imports have so far been sufficient to prevent the disaster which was being predicted in the press. The rain was very late in many areas, but heavy when it came, so this season’s crops are unlikely to be good. The government has provided for substantial increases in the prices to be paid to farmers for food crops with differential regional prices which will favour the production of sorghum, millet and cassava in drought prone areas. An extraordinary National Congress of CCM was held in January which endorsed important changes in the Party’s constitution. Membership of the National Executive’ Committee (NEC) has been expanded to include 90 members from the Regions and from Zanzibar elected by the National Conference from a list of candidates drawn up by the NEC. The NEC will choose the members of the Central Committee, the Secretary-General of the Party and the Secretariat of the NEC. The Central Committee, in addition to the Chairman, Vice-Chairman and Secretary of the Party, will have 15 members chosen from among the members of the National Executive Committee. Thus the appointment of up to ten members by nomination by the Party Chairman has been abolished. The National Conference will choose the Party Chairman and Vice-Chairman by secret ballot. Previously these posts were filled by acclamation at the Party Conference. It was also decided to separate Party and Government posts at Regional and District level, since the union of such posts in the hands of the Area and Regional Commissioners had tended to result in the Party function being subordinated. These changes will be implemented after elections for all levels of office in the Party have been completed next October. The Congress also approved the National Economic Survival Programme (NESP) and the 1981 Party Guidelines. Re-establishment of Local Government and Cooperatives. Parliament has passed legislation to enable the re-establishment of local authorities and cooperative societies, which were both abolished in the early 70’s. There was strong opposition to the proposal to finance local government through a poll tax and the bill was passed with a majority of only 2 votes. Dar es Salaam will increase its population from an estimated 1 million to over 1.6 million following a Government decision to expand its boundaries to increase its size from 542 to 1223 square kilometres, taking in 50 surrounding villages. The Kipawa area of the City is to be cleared to make room for the expansion and modernisation of the airport. The number of air passengers is growing at 10% a year and there is a need for longer runways and a new passenger terminal. As a consequence of the sugar shortage the increase in its price and the management problems of the Sugar Development Corporation (SUDECO), (see Bulletin No.13, July 1981) Parliament set up a select committee to enquire into the price of sugar. The committee produced a highly critical report* at the January meeting of Parliament. The price increase from Shs.8/50 to Shs.10/- a kilo was held to be an unjustified attempt to shift the burden of SUDECO’s failures on to the consumer. Some sugar estates and factories were badly run, although others were commended for keeping their production up despite shortages of spares. The main faults were in distribution, where there were large unexplained losses, and in the incompetence of the marketing manager and his deputy who were not qualified for their posts, but had been employed on the insistence of the Minister of Agriculture, Ndudu Joseph Mungai. The Minister was severely criticised in the report for incompetence and nepotism. The Minister rejected these criticisms during the debate on the report, but early in February he was dismissed from his post. The Tanzanian Government confirmed on 5th July the existence of large deposits of natural gas at KIMBIJI in TEMEKA District, 40 kms. south-east of Dar es Salaam. The reserves have been estimated at three to four times more than those at Songo-Songo in Kilwa District. In a statement to the National Assembly the Minister for Water and Energy, Al-Noor Kassum, said that in order to continue the exploration with the possibility of further supplies of gas and perhaps oil, the OPEC Special Fund has agreed to provide an interest free loan to finance the drilling of two wells at Kimbiji. * Ripoti ya Kamati Teule ya Bunge kuhusu Bei ya Sukari, Mwaka 1981-82. I am writing to you on the subject of Lebanon. Without any question the Israeli invasion is a flagrant violation of the sovereignty and territorial integrity of Lebanon. It constitutes an arrogant disregard of international law and of the basic principles of mankind’s common humanity; and it cannot possibly be justified on the grounds of a threat to Israel’s existence or security by Lebanon, or from Lebanon by the Palestine Liberation Organisation. No such threat did exist or could exist. The deaths of Israelis from guerilla activity or from terrorism in Israel, or elsewhere, can no more justify the massacre in Lebanon than the assassination of one Nazi official by one Jewish youth could justify the extermination at Lidice. The State of Israel exists and has all the rights of a State. But it has no rights over other peoples or other nations, and it has no right to ignore the United Nations which created it. For the people of Palestine also exist; and they too have rights to a State within internationally recognised borders. The search for a solution to the problem of Palestinians and Israelis living together, each in their own homeland and on the basis of mutual respect, is an urgent one. The suffering, misery, and destruction caused by the Israeli invasion of Lebanon, and its air and sea attacks on the territory of that country, have had a devastating effect upon that search and therefore upon the future security of all the peoples of the Middle East including the Israelis themselves. It is certain that neither the cause of the Palestinian people, nor the authenticity of the P.L.O. as their representative, can be eliminated by death and destruction launched from Israel. The number of children, as well as women and men, killed and wounded as a result of this invasion of Lebanon is at present – perhaps for ever – uncountable, for rescue teams and medical services have been overwhelmed. In addition, thousands upon thousands of people have been forced to flee from their homes and are wandering as refugees without food or shelter. Yet this tragedy has led to another: the world has been looking on as if it were helpless. Indeed one would almost think that we are all indifferent to the suffering, and ignorant of the danger of an even greater conflagration following upon this Israeli attack upon a United Nations member-country. And there is yet a third tragedy. It is that those who suffered from the holocaust, and whose state was established out of the world’s sympathy for the victims of that attempt at genocide should now themselves be engaged in what appears to be little less than an attempt to exterminate another people. I am appealing to you to use the great influence, prestige and power of your country to do everything possible to bring Israel’s invasion of Lebanon to an end. In particular, and with the utmost urgency, I appeal to you to take such actions as will deter Israel from carrying out its threatened attack against West Beirut, and as will cause a speedy withdrawal of all Israeli forces from the territory of Lebanon. I am sending a similar appeal to the Leaders of all other Permanent Members of the United Nations Security Council. My hope is that, either individually or collectively, you will act in accordance with the responsibility which this position gives to your nation for the maintenance or the re-establishment of peace and security in the world. Five Tanzanians have been charged in the United Kingdom with the act of hijacking the Air Tanzania aircraft. All five are related through birth and marriage: two pairs of brothers and a brother-in-law (whose sisters are married to the eldest brother in each pair). All five are young people in their early twenties. Their standard of education is Primary School Standard Seven up to Secondary School Standard Twelve (equivalent to Junior Secondary in the U.K.). One elder brother (the leader of the group) is a taxi driver. The other elder brother is an odd job man. The rest were all school leavers at the time of the hijacking and were thus not in any employment. Despite claims to the contrary the leader of the group had had no military training in Tanzania nor any connection with the Tanzania Peoples Defence Forces so far as could be ascertained. Only the leader of the group had been outside Tanzania before. He had worked as a seaman, in the course of which he had visited the United Kingdom and Greece among other countries where ships call. The two married men had their families on board the aircraft – one a wife and two children; the other a wife and one child. All the 5 relatives returned to Tanzania with the other hostages after failing to secure permission from the British authorities to remain in the U.K. The decision to refuse the request to stay was made by the British authorities. The weapons (real and imitation) used by the hijackers to secure control of the aircraft included: two wooden imitation pistols, an imitation hand grenade, two candles wrapped up to appear like gelignite explosive sticks and three knives. But in the course of the flight possession was obtained of a hand gun (0.38 revolver), a shot gun and a rifle. These weapons belonged to passengers who had surrendered them to the Captain of the ‘plane in accordance with the regulations on the transportation of arms on aircraft. The ammunition for the 0.58 revolver which wounded the First Officer was obtained by the leader of the group from the owner after threatening him with a knife. The aircraft was under the command of a Tanzania captain assisted by a First Officer and a crew of 3. The flight left Mwanza with 99 passengers on board all bound for Dar es Salaam. 5 disembarked in Nairobi and 2 in Athens, the rest continued with the flight to Stansted. All hostages except two returned to Dar es Salaam in the hijacked aircraft. The two exceptions were the First Officer who was still in hospital recovering from his injuries and a subsequent operation to remove the bullet and a Roman catholic priest whose final destination when he boarded the ‘plane at Mwanza had been Rome. The priest had hoped to stay in Dar es Salaam for a few days making arrangements to travel to Rome for medical treatment. In the event he found himself at Stansted and it made no sense for him to return to Dar es Salaam only to arrange another trip to Europe. So he travelled direct to Rome. No other passengers remained behind despite wide-spread reports to the contrary. From the accounts of the many people who established contact with the hijackers and especially those who negotiated with them, there appear to be only two consistent themes in their demands. The first one is that of wanting President Nyerere to resign. The reasons they gave were incoherent, confused, even laughable e.g. the entire original charge of “fascism” advanced by the leader of the hijackers: The second one is derived from the way the hijackers acted. Why did they bring along their families? Did they expect that after carrying out the hijack the British authorities would allow them or their families to remain in the U.K.? Whatever they might have thought, the result did not warrant the methods and it is regrettable that some commentators should lay blame on anything else but wrong-doing. The leader claimed a membership of some 3,000 young men and women of an alleged movement which he variously described as the “Tanzania Youth Democracy Movement” or the “Tanzania youth Revolutionary Movement”. Investigations carried out both during and after the incident have revealed no such movement. Instead they have led to the arrest of four accomplices in Tanzania. These have now been brought before a court to answer a charge of conspiracy. There was only one casualty throughout the ordeal, which lasted for 36 hours between Mwanza and Stansted – that of the First Officer who was shot by the leader of the hijackers in circumstances which suggest carelessness. The whole strategy of handling the hijackers was to buy time without giving in to their demands. As part of this strategy the negotiations were intended to talk them into submission. By the end of the first round of negotiations involving the High Commissioner on Saturday night and Sunday morning the strategy was already paying off. The hijackers were already showing signs of fatigue and it was quite apparent that they could not hold out for much longer. That, at any rate, was the impression they gave the negotiators. For example, by about 2.00 a.m. on Sunday morning they were too tired to open the aircraft door to receive the food and water they had been clamouring for. Thus it was no surprise when they gave in and released the first seven hostages some moments before Kambona came on the scene. Soon after all the rest were released. The five are facing trial in the U.K. in accordance with the law here. Despite press speculation, Tanzania is quite happy to see the law take its course and has made no attempt to seek the extradition of the five to Tanzania. The basic 1982/83 – 1984/85 Tanzanian economic policy objectives and guidelines were presented to the National Assembly on June 16th, 1982 in the budget speeches of the Minister of State for Planning, K.A.Malima and the Minister for Planning A.H.Jamal. The broad policy structure of reconstruction planning is set out in Structural Adjustment Programme for Tanzania. The initial time frame set is 1982/83 – 1984/85, but the accompanying Budget Speech which contains the first year’s resource allocations implies that the period may be as long as five years. In terms of immediate action the Structural Adjustment Programme’s 1982/83 tranche shows no marked changes on 1980/81 policy. It is a set of retrenchment measures. These result in a sharper proposed cut in recurrent, as well as capital expenditure because the end of the security expenditure related to the Uganda war and the subsequent reduction in the size of the armed forces has allowed a one-third cut in budgeted expenditure for defence. The 7 to 8.5% rise in nominal recurrent spending by other Ministries and by Regions implies a fall in real recurrent services of 4 to 7%. The very sharp increase in parastatal rehabilitation and subsidy expenditure estimates for 1982/83 (not necessarily an equally large increase over actual 1981/82 expenditure) is related to past agricultural and transport parastatal losses and to the unsustainably high prices set for several crops – notably cotton, tea and tobacco – in 1981. The absence of either a sharp increase in staple grain and flour prices, or a minimum wage increase to offset inflation, represent a change from the approaches to deficit and income management in 1980 and 1981 as does also the absence of any tax increases. There are no tax changes, resulting in a very large and uncertain local borrowing requirement of Shs.4,376 million. The uncertainty arises because the logic of the Structural Adjustment programme includes substantial additional foreign resource inflows – including $210 million in IMF drawings and a World Bank Structural Adjustment credit – which are not as yet negotiated. If they are negotiated and received promptly a smaller deficit is likely, but if late or not at all a much larger one is certain. The Structural Adjustment Programme is in part a consolidation of elements from three earlier Tanzanian forward planning exercises: the abortive 1980-83 Structural Adjustment Programme, which foundered on non-acceptance by the Bank and the 1981 coffee price collapse; the 1980 decadal development proposals to the UNCTAD sponsored “least developed” conference series (notable for lack of practical response) and the 1981 and 1982 National Economic Survival Programmes. Because the external economic context ‘has worsened substantially during the period 1980 to 1982, the present Structural Adjustment Programme is far more draconic in its implications – albeit remarkably non-specific on what actual cuts are seen as acceptable. The policy statements on exports, incentives and efficiency consolidate those of 1980/81 and 1962/82 in a somewhat more coherent way, but specific measures (at least in an applicable form) are less evident than in the earlier statements. The stated commitment to maintaining achieved degrees of egalitarianism and levels of basic services reads somewhat oddly in the light of what the Budget does not include in votes and wage changes, though the sharper decreases in defence spending and •the capital budget have allowed some protection of health, education and water (the key basic service heads). Given the level of subsidies to agricultural products, probably over Shs.1 ,500 million or over 10% of recurrent estimates as a whole totalling Shs.14,144 million, increases in peasant real incomes are clearly dependent either on increases of output, reductions of transport and storage losses, or cuts in procurement, transport and marketing costs in both the private and public sector. A substantial number of proposals for directions of change, new approaches and rehabilitation packages are made. These are less interrelated, detailed or costed than in previous Tanzanian planning exercises. This may be because of the short time that elapsed between receipt of the report of “Three Wise Men” chosen jointly by the World Bank and the Tanzanian Government (formally known as the Tanzania Assistance Group, with three experts and a supporting secretariat)* in April and the mid-June budget deadline for the presentation of a Tanzanian programme harmonising their proposals with existing Tanzanian strategy. It may also relate to the fact that the detailed elaboration of proposals and programmes dependent on foreign finance prior to having been able to negotiate agreement on that finance, at least in principle and in order of magnitude, is not necessarily very useful and runs a distinct risk of over optimism. The section on parastatal performance notes the very uneven performance – from good to abysmal – and the negative effect of the weaker parastatals on the performance of others. It re-stresses the problems caused by inadequate accounting personnel and by the refusal of many parastatal managements to accept responsibility. It calls both for the enforcement of the existing legal rules on the preparation of parastatal annual capital and operating budgets and the approval of budgets by Planning and Finance, also for substantially greater worker power through strengthened Workers Councils and enhanced representation at board level. The outcome of the 1982/83 – 1984/85 Structural Adjustment Programme (and any extension to 86/87) depends in the first instance on negotiations with the IMF and the World Bank as well as other sources of external finance. With exports covering less than half of essential (slightly over half of actual) imports, no workable medium-term economic strategy, including one aimed at raising the ratio of exports to import requirements, can be made to work without either a sharp increase for three to five years in concessional resource flows, or a sharp recovery in the terms of trade (now perhaps 50 on a 1972 base of 100 or 45 on a 1976/77 base). The latter appears quite out of the question as neither a 100% increase in the price of coffee, tea, cotton and cashew nuts, nor a 50% fall in those of manufactured goods and petroleum, are in the least likely. Whether the reiterated stress on exports, incentives and productivity – now apparently in large measure endorsed by the “Three Wise Men’s” report – will have more success in allowing access to Fund and Bank resources than in 1980 and 1981 remains to be seen. * see Bulletin No.13, page 2. Mwongozo was adopted by the National Executive Committee of the Party at a meeting held between 23rd November and 7th December 1981, ten years after Mwongozo of TANU, 1971. It is an important document for a number of reasons. First, it draws upon the experience and thinking of a decade and represents a considered reaction to the practical problems that have arisen as Tanzania has attempted to put into practice the principles and policies of the Arusha Declaration of 1967 in an increasingly unfavourable world economic climate. Secondly, it is wide-ranging in its impact on matters economic, social and constitutional. Though some of its conclusions are likely to be constrained by financial limitations, Mwongozo provides an agenda for discussion in many spheres in the months and years to come. Finally, and perhaps most importantly, Mwongozo offers us an inspection window into the thinking of leading Tanzanians, including President Nyerere, the Chairman of the Party. Mwongozo is in Kiswahili and was intended as a handbook for Tanzanians, a pocketbook for Party members, not for the outside world. We may not always agree with that thinking, but that is not our business. The importance of Mwongozo is that it shows us how Tanzanians are reacting to their own situation in the light of certain social principles, which they believe to be supremely important and which many elsewhere would agree to De indeed important to the world in general. We may sometimes feel that the Tanzanians are only fumbling, but many of us in the West do not even fumble. Mwongozo is too long to reproduce in the Bulletin, but a somewhat shortened version in English is being prepared for circulation shortly to all members of the Society. The recurrent failure of Tanzania to feed itself and the consequent necessity to supplement home-grown supplies with imports, which are costly in foreign exchange, have drawn attention to the need for a more systematic appraisal of the conditions needed to avoid future shortages and to provide for the needs of a rapidly growing population. Table I shows the extent to which cereals have been imported in the recent past and the wild fluctuation of imports; it also shows the growth of population. Cereals includes maize, rice and wheat. Sources: Imports of cereals 1969-79, ‘Food production, trends, problems and possibilities – Tanzania’ by C.S.Lombard, Oct. 1981. Imports of cereals, 1980, ‘Hall ya Uchumi wa Taifa katika Mwaka 1980’, Government Printer, Dar es Salaam, 1981. Estimated population based on the censuses of 1967 and 1978. It is widely maintained that Tanzania ought to be able to feed itself and to consign sufficient to reserves for the lean years. That it does not do so has complex causes, which include the present frailty of the economic infrastructure – storage, roads, transport vehicles and crop marketing management; agricultural errors of judgment and of timing; the planting of unsuitable crops in high risk areas; and problems of peasant motivation. The extent and reliability of rainfall is the most important variable which affects crops. During the sixties rainfall was above normal and this tempted peasants to extend the growing of maize into high risk areas in place of more drought resistant crops, such as the millets and sorghum. Maize has a number of advantages over millet and sorghum. It is less susceptible to bird attack and diseases and maize flour is more palatable and therefore more popular and more saleable. But maize is also more vulnerable to rainfall variations and deficiencies and a crop may be spoiled by premature planting before the rains have properly set in. Reliable rainfall during the middle growing period is essential. Valuable work has been done by the FAO/KILIMO Crop Monitoring and Early Warning Project as a guide for planting policy on the incidence and variations of rainfall in various parts of Tanzania and the effect on crops. Unlike soil variations, rainfall deficiencies or excesses cannot be corrected, except in those limited circumstances where irrigation is practicable, and can only be taken into account in crop planning. Moreover, the choice of crops must take into consideration not only the amount of rainfall, but also its reliability. Difficulty is liable to be created by a succession of years over which rainfall has been ample or deficient, as this tends to encourage planting practices, which are not justified over a longer period of reference. Statistical information about food crop production is hard to obtain and reliance is normally placed on the amounts purchased from the peasants and the state farms by the National Milling Corporation for sale in the towns and in deficit areas. But the figures of marketed crops ignore the amount retained by peasants for their own use. How this varies is a little obscure. It is no doubt a first charge on production, but in the lean years families may nevertheless deny themselves for the sake of at least a minimal money income. The figures of NMC purchases over recent years have fluctuated wildly and it is not easy to distinguish a trend, but by using three-year averages to minimise seasonal variations, it appears that between 1969-72 and 1977-80 purchases of staple grains rose by an average of 1.8% per annum. As the population is understood to have risen during that period at a rate of 3.3% per annum – even more rapidly in the towns – the volume of staple grains available for marketing fell by 1.5% per annum per head of population during that period. But this technological approach to increased production may well obscure the problem of peasant motivation, which clearly lies at the heart of the immediate problem of production. As the Bank points out, substantially increased producer prices are essential. They are important not only to raise the standard of living of the peasantry, but also to give substance to the official emphasis on rural development and to convince the peasants that the wealth they create is not being needlessly dissipated in the interests of a swollen and urbanised bureaucracy. These psychological factors, which seem to be well understood by the Party (5), are immensely important for overcoming the food problem. The cooperation of the peasantry has to be won and cannot be elicited merely by pressures and directives. There is, in fact, statistical evidence of the sensitivity of the peasants to the level of producer prices. When the National Milling Corporation began to purchase drought crops (sorghum, cassava and the millets) in the early seventies, the unduly favourable prices offered caused a diversion from the preferred cereals and created for the Corporation a serious problem of storage and disposal. Peasants need cash for buying consumer goods and materials for house building (nyumba bora). The presence of goods in the village dukas (shops) is an important factor in peasant motivation. Communal farming (ya kijamaa), which is encouraged by the Party, is successful in areas in which it is seen to provide an adequate income for the provision of social facilities- schools, clinics, village roads, water supplies, maize mills, etc.. Here again, success depends in part on the visible returns. Tanzania’s economic situation is not favourable for securing for the peasant the full benefits that a buoyant rural economy might be expected to yield. This no doubt accounts in part for its sluggish response. But despite immense difficulties in maintaining industrial production and the means of transport, there remains room for improvement by the choice of priorities and by maintaining the rural emphasis for which Tanzania has been justly famous. 1. The information in this paragraph is from ‘Rainfall Variability, Types of Growing Seasons and Cereal Yields in Tanzania I by R.A. Gommes and M. Houssiau: FAO/KILIMO Crop Monitoring and Early Warning Project, Dar es Salaam, 1982. 2. World Bank: Tanzania Basic Economic Report, Washington, 1977. 3. ‘L’Afrique Etranglee’: Rene Dumont and Marie-France Mottin: Editions du Seuil, Paris, 1980. 4. Mpango wa Pili wa Taifa wa Kujihami Kiuchumi wa Mwaka 1982. In 1962, less than a year after independence, Tanzania adopted a Preventive Detention Act giving the President power to detain indefinitely and without trial persons acting in a manner threatening the security of the state. In the fragile post-independence period of the early 60’s many African states, including Ghana, Kenya and Zambia, passed similar laws. But now, 20 years after independence, members of Tanzania’s judiciary have been calling for the repeal of the Preventive Detention Act. At a Faculty of law symposium in January, Mr. Kalunga, Principal State Attorney in the Ministry of Justice, presented a paper calling for the repeal of the Preventive Detention Act. This is the latest such public appeal. Several months ago a small book entitled ‘Honest to my Country’ (see TA Issue 14, p.16), written anonymously by a Tanzanian lawyer, called for doing away with the detention law. Then in December a court of appeals judge, R.H. Kissanga, said that the time had come seriously to consider repealing the law. Over the past two years a number of judges have heard cases involving detainees and some have written opinions very critical of the way the law is implemented. In this latest critique Attorney Kalunga called the detention law ‘a menace to everyone in the country’. The Act, he wrote, was a horrific piece of legislation, difficult to defend, and its utility was certainly zero. To the ordinary citizen, whose heart is full of love for freedom in his motherland, the act is a nightmare. It creates fear, unhealthy and unnecessary submissiveness. Kalunga’s controversial paper stimulated three hours of lively debate. The audience included Tanzania’s Attorney General, a number of judges, several MP’s, professors of law and several ex-detainees. Most speakers advocated repealing the Preventive Detention Act. A number, including the Attorney General, said it should be more carefully implemented and perhaps revised. Only one speaker defended the law as it is applied. Opponents of the detention law argued that nowadays Tanzania is politically stable and that therefore the original reason for the law no longer exists. Some legal experts said that the law itself is redundant, since there are other laws which adequately protect against any threat to national security. Further, a number of speakers said that the act puts far too much power in the hands of one man, the President, and that it does not give detainees their fundamental rights, such as the right to legal counsel, or to be charged and tried in court for their alleged offences. And according to some of the speakers the law, harsh as it is on paper, is being grossly misused. They said it has become a catch-all for locking up a variety of common criminals whom, for one reason or another, the executive branch and the police cannot, or do not want to, bring to court. Those being detained nowadays are very rarely political opponents of the Tanzanian government. Rather they include small and big time criminals, such as habitual drunkards, cattle rustlers, thieves, embezzlers, smugglers, foreign exchange violators, racketeers and economic saboteurs. As one speaker, High Court Judge and Member of Parliament Nassoro Mnavas, said, ‘the law itself was originally passed to deal with political malcontents after independence. But unfortunately it is now being misused to supersede ‘ criminal law’. Neither the names nor numbers of detainees are made public. And my attempts over the past several weeks to obtain this information have, so far proved futile. But according to knowledgeable people I’ve interviewed the number of presidential detainees may be as high as several thousand. In his remarks at the symposium Tanzania’s Attorney General, Joseph Warioba, said he was disturbed by much of the discussion, which he considered ‘a bit one-sided’ and ’emotional’. He said ‘we must look to see if there are enough safeguards’ in the detention act, but concluded: ‘I do not think we can say that we can do without the law at this time’. Just what will happen next remains unclear. However, it does seem that at a minimum there will be efforts to crack down on the current widespread misuse of the detention law and that the courts may become more aggressive in hearing detention cases. And at some point parliament may be asked to debate whether or not it should revise or repeal the detention act. ‘After food and clothing, shelter ranks third amongst the basic necessities of life’. The Minister of Lands, Housing and Urban Development repeated this message at the conference held in Arusha to work towards a national housing policy for Tanzania. He continued: ‘when Tanzania became independent on 9th. December, 1961, the government took immediate steps to provide decent housing to all Tanzanians irrespective of their income or race’. The conference was only too able to assess how this objective had fared as it listened to papers which spelt out the problems both in the past 20 years and in the way ahead. Like many developing countries the Tanzanian population has been growing Rapidly – currently at a rate of 3.3% per year (doubling in 20 years) – since independence, with a present population of 19 million. Half of this 19 million is under 15. It is not difficult to imagine the demands for shelter generated by such growth. Compound this with the experience that the traditional house-type lasts about 7 years depending on mud, pole and branches for the main constructional items. The net outcome of this calculation is that about 600,000 houses were being built or rebuilt in 1978. It is not amiss to recall that the UK, with a population 3 times the size and a GNP per head 24 times greater, has managed 500,000 houses in a year only once. This scale of the problem is, however, complicated by the movement of rural people towards the towns. While largely a rural country (85% live in villages) the main towns, and especially Dar es Salaam, are growing at over 8% per year. leading to substantial areas of squatters’ houses, of which there are 100,000 in Dar es Salaam alone. This movement to the towns aggravates the housing situation since such a move is towards a cash economy, needing to buy materials for proper shelter from a largely subsistence agricultural economy with materials near to hand. So there are major factors of populations growth, urban drift and material availability. How have the formal public housing institutions tackled these very substantial tasks, as promised in 1961? The picture, it has to be said, is not good. The Minister stated that the National Housing Corporation since 1962 had built no more than 14,000 homes. The Registrar of Buildings had also constructed 400 houses. Site-and-Service projects had released a further 9,000 plots for individuals to build their own homes. These approaches are clearly not meeting the needs of the bulk of Tan2anians, concentrating, as it transpired, on high quality, high cost units in urban locations. As a new approach, the Tanzania Housing Bank (THB) was established to provide mortgage finance for people to build their own new houses. Such finance would also be available to villages as a whole and as such the THB played a significant role in the implementation of national governmental policy for the creation of new and centralised village settlements, which were to form the basic organisational units of the country and the Party. By the end of 1979, 27 villages had borrowed to finance 2,000 houses, as well as individual loans. Yet it was still the urban areas with 15% of the population that were getting half of the available finance, due largely to rural inaccessibility of the urban-based THB and to its conservative approach to income requirements and repayment schedules (over three quarters of the THB borrowers earn more than twice the average income). These rules become a major constraint when Tanzania’s GNP per head is amongst the lowest 15 in the world. So there is a huge gap between the houses that are reported as being constructed and the comparatively few houses that the formal institutions have been funding. The contribution from the informal sector is thus the bulk of all housing activity. It is not surprising that the Arusha conference resolved that the starting point for a national housing policy was that home ownership should be encouraged. The closing speeches that now ‘Tanzania has very limited resources to provide public housing. That is why the Government and Party encourage Tanzanians to build their own homes instead of waiting for the Government to provide housing for them.’ Self-reliance is now the watchword for housing provision; it is a long way to come in 20 years. Self-reliance will apply to materials and to construction and financing. One reason of course why so few houses were funded publicly was the high standard required by a building code exported from Britain in the thirties and unamended since independence. It related well to urban aspirations of importance and mortgage security. Its critical failure, however, was its almost total dependence on cement blocks and on imported components, including the raw materials for corrugated iron or aluminium sheets. The money cost was itself high (over twice the cost of an indigenous brick house), but its major national disadvantage was the high import content. And that is a disadvantage worse today than ever, when the average import capacity of the country is only half what it was in 1972 or 1976. The terms of trade have moved radically against the country since then and the lack of resources has led to a drop in income of about 50% over the last 3 years. There is now internal cement production, but it is fired by fuel oil, which has itself to be imported. The product when finished has to be distributed by diesel-fuelled vehicles. The planned output is to double, but the National Economic Survival Programme priorities may not allow such consumption of extremely valuable and expensive imported resources on housing projects, when they could be applied to utilising more of the economy’s productive capacity, which is only 3o% utilised at present. If national priorities determine the resource allocation of high cost construction materials, it becomes even more essential that locally available materials are used, to locally agreed standards and designs and by locally comprehended methods of construction. These now form the key planks in the ‘nyumba bora’ campaign to improve rural housing. The Arusha Appropriate Technology Centre has developed particular soil cement mixtures compacted in a manually operated mould-machine to provide traditional house-types with a much longer life. Such a machine, with adequate training and repair backup, form~ a sensible approach for a village construction unit to provide rural housing at a 35% saving over sand-cement blocks. Again, in appropriate areas one can often see very small scale clay pits providing bricks to be fired locally. The importance of local production is highlighted by the fact that the westernmost Districts use 40 time less cement per head than those at the capital. The other key local element is that of education being undertaken by the Party (CCM) and local officials both to advise on the long-term advantages of improved long-life housing and on the need for joint village working to build and finance them. At a practical level there should be technical support via the Rural Construction Units, which should be equipped to train and assist villagers in building, joinery, bricklaying and plumbing methods. If these key areas can be successfully tackled, the number of houses needed could drop from 600,000 to 200,000 per year, since each improved house would last of the order of 4 times as long. Even that would demand resources of an estimated shs.1.4 billion per year, which even reduced to an individual village scale must be doubtful in view of the low real income from cash crops. This financing area is crucial, since villages have to raise loans from the THB to fund the works with little state financial support. The success of such a strategy depends on major relaxations and improved accessibility on THB’s side as well as substantial income and commitments by the villagers. Certainly evidence on the ground at the moment indicates a substantial number of houses still being built of traditional .materials of mud and laths on a pole framework. In the towns, the authorities have accepted squatters as an unavoidable component of housing policy and have embarked on a programme to upgrade squatter areas. This is by way of loans from the THB to individuals. The state cannot provide new housing and amenities, but it aims to improve the surroundings if owners improve their own homes. The success of this in mobilising resources, coupled with the Site-and-Service Programme, is indicated by Dar es Salaam’s consumption of 40% of the national output of cement. The Squatter Improvement Programme is one area in which the World Bank has made material contributions to improve the homes of 315,000 people throughout the urban areas of Tanzania. Nevertheless, the issue of squatter areas will continue. There are 100,000 squatter houses in Dar es Salaam now and urban populations must be’ expected to rise from 3 million to 10 million in the next 20 years. It would be foolish to pretend that all the urban workers will be able to afford THB loans: but can Tanzanian society accept the South American, or even the Kenyan, scale of alienation? ‘Tanzania- A Political Economy’: Andrew Coulson, Clarendon Press, 1982. £6-95 (paper). Tanzania currently suffers from many shortages, but it has been studied and written about in abundance. Much has been published about aspects of Tanzania’s history, politics and economic development, but it is not easy to obtain, or always comprehensible. Andrew Coulson has drawn together the writings of the past decade to produce a comprehensive and highly readable account of the development of modern Tanzania. Its scope and clarity give it a strong claim to be the standard work on the country, which has long been needed and as such it will have considerable influence and its interpretations could become a generation’s judgment on Tanzania. As Coulson makes clear in his first chapter, he is writing on two levels, an introductory outline of the country and an analysis of the ‘underlying, historically determined economic position.’ The story of the creation and development of Tanzania is interwoven with a rigorous comparison of official policy and actual performance, that some readers will feel to be so unrelentingly critical of both colonial and independent governments as to verge on the destructive. The first third of the book is ‘the story of the incorporation of this land area and these people into the ‘World capitalist system’. The failure to resist or deal with the consequences of this are seen as the root cause ‘of Tanzania’s current problems. Prior to colonisation, the tribal societies were probably better fed than today’s population, crafts were developing and there was considerable internal trade. These achievements had been assisted by imported innovations, but were reversed by colonial conquest and the associated destruction and epidemics. The skills which had been evolved to survive in the harsh environment were lost as a new economic pattern was established, the production of crops for sale and labouring on plantations providing for European industry. The subsequent efforts by successive governments to revive peasant agriculture have been characterised by assumptions of peasant idleness and ignorance, whereas they have proved themselves enterprising and efficient on the occasions when they have been given clear incentives. The colonial powers also prevented the establishment of industry, which might have been developed, based on the exploitable minerals and the processing of crops. Both the official attitude to the peasants and the belief that the country could not support viable industry were largely inherited by the nationalists after independence. Colonisation also brought a fundamentally different concept of education. Coulson gives a brilliant, concise explanation of the devastating impact of western education on traditional society. His denunciation, in highly ideological terms, of mission and government education provision will offend those who were involved or have knowledge of the personal dedication of the teachers and administrators, who struggled in difficult conditions with pathetic resources, but he makes a powerful case. There is an important reassessment of the achievements of Cameron, whose governorship between the wars has been regarded as crucial in setting the country on the road to eventual independence. Cameron is credited with resisting the aspirations of European settlers and encouraging limited African development, but he did not understand and ignored the damaging influence of Kenya’s more dynamic economy. His commitment to indirect rule could not make it a reality in Tanganyika, where tribes had never become fully formed and many legitimate chiefs had not survived the German conquest. Despite his criticisms of colonial policies on education and industrialisation, Coulson sees the growth of nationalism as a consequence of education and the expansion of towns. He has a sympathetic note on Martin Kayamba, whose African Association established for the educated elite became the basis on which TANU was organised, although there is an implied criticism that TANU ought to have evolved from Eric Fiah’s African Welfare and Commercial Association, which had political aims and claimed to speak for all Africans. In his assessment of Nyerere, Coulson rejects both the adulatory biographies and those who manage to write about Tanzania without mentioning his name. There is respect for his political skills, which have enabled him to survive, but Nyerere’s vision of agricultural development being achieved through living in villages is considered to be fatally flawed. The total commitment to modernisation theory, the dismissal of traditional forms of agriculture and the adoption of government as the main, perhaps only, provider are identified as the essentially false assumptions of Nyerere’s ideas and policies. This is a criticism of Nyerere’s basic philosophy, not of his failure to ensure the implementation of his policy by unsympathetic subordinates, but it is questionable as a summary of Nyerere’s thinking, which ignores his appeal to traditional values in ‘Ujamaa- the basis of African Socialism’, his repeated pleas for the use of ox ploughs and good thatch rather than tractors and corrugated iron sheets and the self-reliance objective of the Arusha Declaration. It is certainly true that Nyerere did not transform TANU into the instrument of government. Independent trade unions were suppressed and there has been a huge expansion of an authoritarian state requiring the employment of a large bureaucracy divorced from the life and experience of most of the population. The combination of the idea of progress through villages and a bureaucracy distanced from the peasants produced the political and economic damage of the villagisation operation. Villages were required to enable government-supplied social services to continue to expand. Increased production was assumed, but it was never explained how it was to come about. Indeed, peasant production had been growing steadily in the years between independence and the Arusha Declaration. The chapter on ‘Ujamaa and Villagisation’, Coulson’s special interest, is exceptionally good and deserves careful reading and study. The bureaucracy, the effective ruling class, is held responsible not only for the failures in agricultural and rural development, but also for Tanzania’s general economic stagnation. While drought, oil prices and the world economic recession are by implication difficulties that a developing country must expect to have to deal with, the root cause of Tanzania’s problems is its own ruling class, who ‘are not accumulators, have little experience of industry or large scale agriculture and little faith in small scale agriculture, thinking not in terms of investment, but social services, authoritarian with no tradition of self-criticism’, almost totally unsuited to bringing about economic transformation. Coulson sees parallels between the Tanzanian civil service and the British labour Party and his own argument is almost Thatcherite. High taxation has financed a bureaucracy to staff services such as agricultural extension, which have no appreciable effect, and the parastatals with their poor output and productivity records. The consequence has been no resources for productive investment. This is a harsh indictment. Coulson does not produce a comprehensive alternative strategy, but he clearly believes that if villagisation had been left to happen voluntarily through small politicised groups and the peasants given reasonable price incentives they could have continued to produce enough food to feed the country and enough export crops to finance a basic industrial strategy. The cost would have been growing rural inequality as larger farmers expanded production by hiring labour and possibly a slower rate of growth of social services. Inevitably in attempting to cover so much there has to be a great deal of compression, but this is offset by five appendices providing case studies of development. Of these, the one dealing with the Ruvuma Development Association is most welcome. Coulson, in common with many writers, including Rene Dumont, sees the decision to disband the RDA as a watershed, when the Party hierarchy decided that an independent organisation, however committed to socialist development, could not be tolerated. Writings on Tanzania frequently refer to RDA, but this is the first published account of its story. Coulson will be accused of over-concentration on Tanzania’s failures, underrating its problems and ignoring its achievements and also of using valuable pages to explain his concepts of ‘class’ and ‘state’ in the only boring sections of the book, but his explanation of what is happening in Tanzania depends on understanding the nature of the class which controls the state rather than the number of adult literacy schemes organised, or village water schemes provided. Professor Cranford Pratt once complained at a meeting of the Britain-Tanzania Society that the problem of trying to understand Tanzania was that the rival factions of commentators never read each other’s work and an author’s allegiance could immediately be identified by the references quoted. Coulson breaks out of this sterile constraint and also provides suggestions for further reading on the subjects of each chapter and a useful bibliography. Little about Tanzania is simple. The words ‘paradox’ and ‘ambiguity’ seem to occur in most chapters and it is possible to value and enjoy Coulson’s book without sharing his despondent conclusion that ‘despite elements in its favour, the contradictions and stagnation of the nineteen seventies are likely to continue’. ‘Development and Religion in Tanzania – Sociological Soundings on a Christian Participation in Rural Transformation’: Jan P. van Bergen, Dar es Salaam, 1981. This book was written as a result of the Senate of the University of Dar es Salaam granting Mr. van Bergen the status of research associate, a post held until 1976; the subsequent write-up emerged in 1981. The book highlights the Church’s reaction to institutions and programmes which sprang up after independence. There was an initial fear of development being overtaken by communism. This was especially so after the Arusha Declaration. There is also current anxiety about a possible increase in Chinese influence. The involvement of Muslims in various political structures also causes great uneasiness. The government controlled newspapers, the Daily News, the Sunday News and Uhuru, appear to many Christians to be hostile to the original teachings of Christ and what they imply in relation to marriage customs and family life in Africa. With regard to villagisation, the reaction of the Church has been very mixed. Pastoral considerations have always been in favour of people living together in clusters, because it makes for easier contact with people and parochial activities. The missions with their buildings, plant and plots of land became natural centres for the planning of new villages. However, when villagisation programmes got under way, new settlements were planned far from the traditional church-parish complex. When whole communities were moved, the Church leaders angrily condemned this, because they would be separated from their people and church buildings would become obsolete. As van Bergen points out, ‘the community concept of Christians differs from that of ujamaa’. The latter is less exclusive. Its focus is different from the Church and does not contain reference to a special religion or faith. Julius Nyerere writes: ‘The Tanzanians themselves have religion, but the community has not. The Sheikh has his religion, the Christian has his faith, the traditionalist has his convictions. But there are also religions which cause unrest and trouble’. The President has held meetings with Party officials, members of the government and religious leaders so that there is a real dialogue and mutual feelings of misunderstanding, if not dispelled, are “freely communicated. The President has also discussed ways in which the clergy could involve themselves in the ujamaa experiment. The image and ideology of the Churches influence their credibility in proclaiming values and ideas in the field of nation building. This does not mean that the relationships between Church and state are bad or hostile. Neither is it true that the Churches do not try to contribute to the formation of good citizens. The delicate balance in ideology remains because both institutions realise that they need each other. The Party needs the Church because of its influence on the masses, its educated leadership and its financial potential. The Churches need the Party because. in a secular society in which several world views, faiths and religions are present, the political Party is the unifying identity. ‘Mozambique and Tanzania – Asking the Big Questions: Frances Moore Lappe and Adele Beccar-Varela: IFDP, San Francisco, 1980. The material for this book, which aims to compare the efforts made by the leaderships in Tanzania and Mozambique to achieve food security, was collected during a summer trip to both countries in 1978. The authors do not mention how long this trip lasted, but they do admit that they were not able to talk to many ordinary Tanzanians and Mozambicans due to shortage of time and language barriers. Their essay is essentially ‘an attempt to define how the leadership in each country defines the development process they are helping to shape’. The central argument throughout the book is that, although Mozambique and Tanzania both claim to be on a socialist path and the leadership in both countries aims at equity, participation and cooperation, there are sharp contrasts in the methods adopted by each to achieve their socialist goals. The picture painted is of Tanzania’s elitist approach, in which decisions are made ‘top down’ and policies implemented coercively at the expense of aims to mobilise and involve the people. Mozambique, however, due to its experience of the armed struggle against Portuguese colonialism and the peasant and worker mobilisation in the liberated areas, has created more democratic and accountable leadership structures, that are more grass roots based, and its policies seek to gain the active participation of the people. Whilst the authors admit several times the difficulty in drawing comparisons between a country like Tanzania with 18 years experience of independence and another like Mozambique with only 4 years and with such different histories and physical infrastructures, they say they are only attempting to compare the approaches and priorities of the leaderships in each and not their success records. The authors emphasise that Tanzanian socialism is not of the scientific marxist type, but is based on the moral bedrock of ‘goodwill’ in which the interests of the whole community are put before personal and private interests. Nyerere claims that these principles were embodies in traditional African communities. Mozambique’s socialism, on the other hand, whilst founded in the experience of intense exploitation of the Mozambican people and their life and death struggle to throw off that exploitation, is based on the theory of the class struggle. Hence, Mozambique aims to transform traditional tribal life not conducive to scientific socialism, such as superstition and passive obedience to village elders. The rationale for cooperation and collective solutions to development problems stems not from African tribal traditions, but from practical experience gained in the liberated zones during the armed struggle and scientific socialist ideology. The book then looks at the practical approaches of the leadership in each country in relation to development, production, leadership style and structures, popular participation, villagisation and attitude to foreign aid. The authors find that Tanzanian leaders define development in organisational terms. The main task of leadership is to create effective organisational structures to implement central government decisions at local level. Mozambican leaders, on the other hand, see the task of transforming the people’s concept of themselves and mobilising the people to participate actively in the new society as the key to the country’s development. ‘because this view of leadership in Tanzania resembles closely what we receive from our own culture, it was hard even to perceive whilst we were there. Only after we had spent some time in Mozambique did we become aware of the possibility of alternative assumptions’. In Mozambique they found that the leadership saw the people as a source of energy and direction and leaders saw themselves as accountable to the people and to the decisions taken at the 3rd. Congress, of FRELIMO in 1977, which defined the’ leadership structures and the direction of policy. The civil service is controlled by FRELIMO, which since it was restructured in 1978 has now become a broader-based vanguard party. However, the most important characteristic of Mozambiquan leadership is the inbuilt practice of criticism and self-criticism, which is encouraged and practised at all levels. Leaders who abuse their power, or fail to meet their responsibilities, are criticised and if they continue to behave incorrectly they are ousted. The Minister of Agriculture, who failed to give sufficient priority to rural agricultural development, was criticised and subsequently dismissed. When the authors examine popular participation, they find that in Tanzania there appears to be a ‘top down’ approach, with the authorities at both national and local level identifying problems and local leaders supervising the people in their solution. Mozambique, however, has both upward and downward channels for participation and decision making and their structures rely on local initiative and experimentation, which if successful will be passed on to other communities or groups with similar problems. The selection of Party members and representatives for the local, provincial and national assemblies is done at meetings of people, who put forward suitable candidates, which the Party and local people present at the meeting evaluate politically and finally select. These procedures have resulted in far more peasants, workers and women being selected as leaders. In Tanzania, the author’s impressions are that the vast majority of Party officials work as civil servants and are drawn from the already privileged class of bureaucrats. On villagisation, the difficulties encountered by the Tanzanian government over the last 14 years in persuading people to move into ujamaa villages are described. In the late 1960’s the government encouraged people to move voluntarily, but progress was so slow that by the 1970’s it had resorted to coercion and consequently many Tanzanian leaders lost faith in cooperative principles. The Mozambican leadership, on the other hand, appear to be prepared gradually to implement their plans for people to form communal villages. As popular participation in the planning and formation of such villages is crucial to their long-term success, the Mozambican government does not intend to take short cuts – an example where lessons bitterly learned in Tanzania are useful to the leadership in Mozambique. Whilst I feel that the authors have not been fair to Tanzania in their analysis, perhaps not giving sufficient weight to the different historical circumstances in which the leaders in each country have emerged and not really exploring how the policies work at grass roots level, I think that they have identified some of the most important ways in which the Mozambican leadership is trying to involve its people in building the new independent socialist society. What still stands out in my memory of Mozambique is the accountability of the leadership, the active participation of the people and the control of expatriates like myself. These are the aspects where the authors of this book have found the contrasts between Tanzania and Mozambique are sharpest. Only time will tell if the Mozambican leadership reverts to a more elitist conception of development and to a more bureaucratic and authoritarian mode. This in part will depend on the political quality of the cadres at present in the new socialist schools. The Swedish aid organisation SIDA is to assist ‘with the improvement of Air Tanzania’s ground handling equipment at Dar es Salaam and Kilimanjaro airports and the Irish airline Aer Lingus is to help with a manpower development plan. Air Tanzania’s troubles have included the grounding of aircraft through lack of spares. It is reported that several Western airlines are considering Suspending their services to Tanzania because the Bank of Tanzania has released no currency in payment of tickets for eight months. A trade agreement with Mozambique provides for Tanzania to exchange aluminium sheets, cocoa beans and hoes for welding electrodes, tyres, tubes and sewing machines. A second gold mine (buckreef) developed at a cost of £8 million and employing 300 people has started production and is expected to have an output of 2 kilos a day. A power alcohol plant is planned to be in production at Moshi by 1985 using by-products as raw materials. The alcohol will be made from molasses, much of which at present goes to waste, and will be mixed with petrol. The project will be financed by a French Government loan. The hydroelectric power project at Mtera, 100 miles north of Iringa, is to be financed by a consortium of five European countries, Sweden, Norway, the German Federal Republic, France and Italy, together with the World Bank and the Kuwait Development Fund. The International Development Association (the World Bank affiliate for concessionary lending) has approved a credit of $12 million for the coffee, cotton and sisal authorities, technical assistance for the Ministry of Agriculture and staff for an advisory group to make recommendations to the Tanzanian Government on an economic recovery programme (see Bulletin No.13, page 2). The Dairy Farm Company of Tanzania (DAFCO) aided by the World Bank is purchasing 1,000 dairy heifers and 10 bulls from Zimbabwe. The plan to establish 17 dairy farms each with 350 cows and a breeding centre and to provide 50 ujamaa villages with herds of 20 cows each was launched in 1974 and should have been completed by 1980, but has been extended to 1984. A proposal for a rice irrigation project at Mkomazi, near Korogwe, first investigated in 1950, has been abandoned after a West German report found that it would not be profitable. The Ministry of National Education is to investigate the effects that the adult literacy campaigns have had on the behaviour, attitudes and thinking of new literates. * The early history of the Tanzania Fertiliser Company is described in an article entitled ‘Tanzania’s Fertiliser Factory’, by Andrew Coulson in the Journal of Modern African Studies, 1977, Vol.XV No.1.